Two local SMMEs from Port Elizabeth, are currently benefiting from the construction of the state of the art facility for HELLA, a new investor at Coega Development Corporation. Sikuphiwe Trading, owned by Ncebekazi Mhlaba, is responsible for the brick works and plastering. Whereas, Dicky’s Electrical, owned by Sadick Hendricks, is responsible for the electricity fittings. 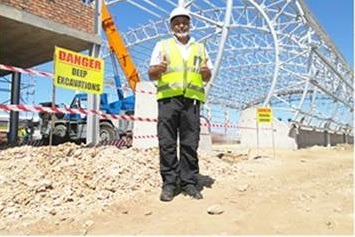 Currently, Sikuphiwe Trading have created over nine (9) construction jobs with Dicky’s Electrical earmarked to create three (3) jobs at the later part of the project. The Coega Development Corporation is continuously fulfilling its mandate and strategic objectives to support the growth and development of emerging businesses in the Coega Special Economic Zone (SEZ). “The involvement and participation of Small Medium and Micro Enterprises (SMMEs) in various projects in the SEZ is an important step in re-imagining our social strata,” says Unathi Maholwana, CDC SMME Programme Manager. The CDC has seen many other SMME participation and benefiting on a number of projects implemented at Coega in the past few months. Some of those projects include the construction of the CDC’s Customs Control Warehouse in Zone 1, construction of the Ring Road around the BAIC SA precinct, construction of Bulk Reservoir, and now the HELLA building. The CDC has two sites in zone 1 & 2, which was designated as Customs Control Areas (CCA). The CCA in zone 1 was a thirty six million (R36 million) investment. “This has led to much needed jobs with over hundred and fifty people (150) employed during the construction phase,” adds Maholwana. The project has seen the involvement of ten (10) SMMEs, who have been awarded work to the value of thirteen million (R13 million). “More importantly is the fact that the project exceeded its SMME target, achieving a 41% SMME spend,” highlights Maholwana. Another project, through which the CDC has benefited SMMEs is the construction of the Ring Road in Zone 1. The value of the contract work that was awarded to SMMEs amounted to R54 million, far exceeding the CDC’s target of 38% on SMME procurement spend,” explains Maholwana. One more project, that has been implemented is the construction of Bulk Reservoir with a total value of over ten million (R10 million). “The project has seen the involvement of three (3) SMMEs. SMMEs have benefited to the value of over five million and nine hundred thousand rand (R5,9 million), achieving over 57% in procurement spend for SMMEs,” describes Maholwana. “The CDC has continued to exceed expectations and leading by example on its infrastructure development projects. In the last financial year 2017/18, the CDC achieved SMME procurement spend of R707 million out of a total of R1,9 billion spent for the year. ,” concludes Dr Ayanda Vilakazi, CDC’s Head of Marketing, Brand, and Communications.